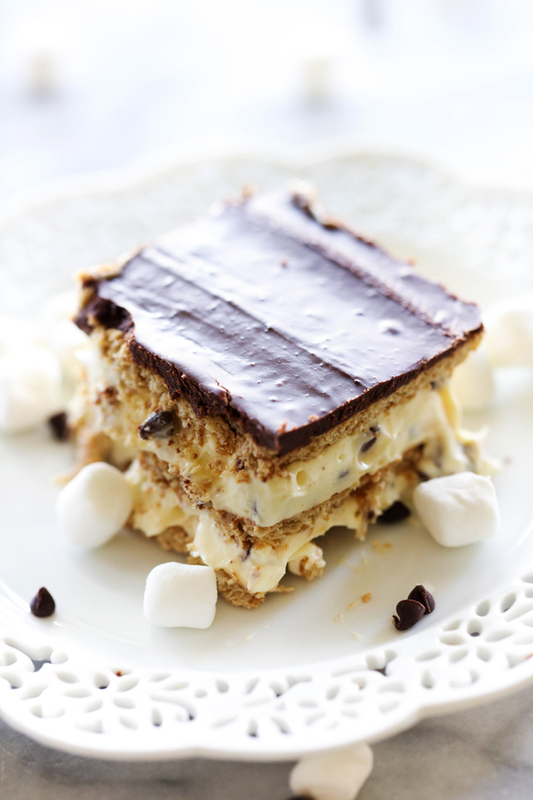 This No Bake S’more Eclair Cake is so easy and is loaded with everything you love about s’mores! The graham crackers soften perfectly to create one mouth watering bite after another! Loaded with marshmallows, chocolate chips, chocolate frosting and graham crackers- this is sure to be a hit wherever it goes! 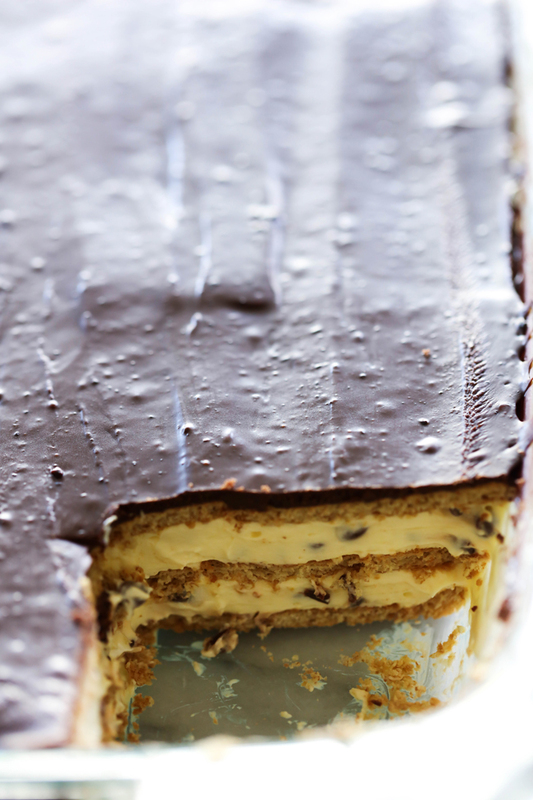 This No Bake S’more Eclair Cake is the perfect recipe for any occasion but particularly great in the summertime. It whips up in no time at all and requires NO BAKING! That is my kind of summer dessert! The graham crackers soften up perfectly to create a delicious creamy bite. The chocolate chips and marshmallows are such a fun surprise throughout the filling of the cake. Together, these s’more ingredients fuse wonderfully to create a unique and tasty treat. If you are looking for that perfect last minute Father’s Day treat, this is a fantastic option! This No Bake S'more Eclair Cake is so easy and is loaded with everything you love about s'mores! The graham crackers soften perfectly to create one mouth watering bite after another! Loaded with marshmallows, chocolate chips, chocolate frosting and graham crackers- this is sure to be a hit wherever it goes! Blend milk and vanilla pudding packets for about 2 minutes. Blend in marshmallow crème until smooth. Fold in Cool Whip.Stir in chocolate chips and marshmallows. FOR THE FROSTING: Microwave butter and milk just enough so that they are melted together. You do not need to boil it. Add cocoa and powdered sugar and blend together. This will be a runnier frosting/glaze. Pour over top of graham crackers and smooth out nicely.